Properly sanitized dishes is essential to health and safety in any food service establishment. 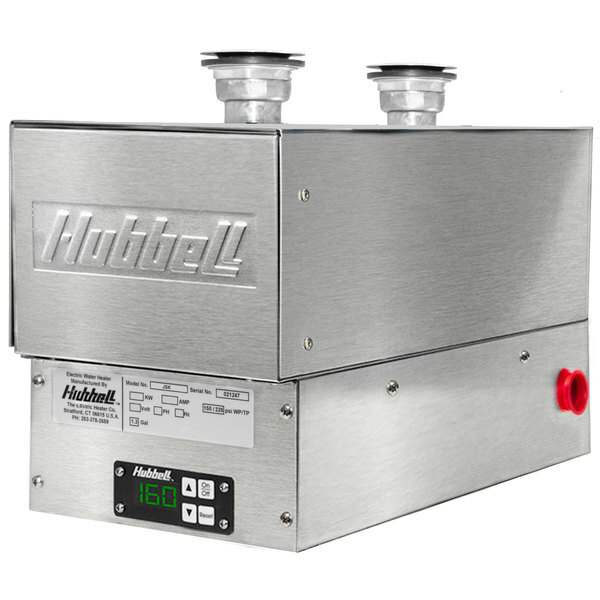 With this Hubbell JSK-4RS sanitizing sink heater, you can rest assured that the water in your bar, pot and pan, or 3 or 4 compartment sink continuously reaches the proper temperature prior to use. Designed for sinks between 16 and 18 sq. in. in area, the heater fits below the sink area for compact installation that's out of the way, but easy to access when needed. It even features easy-to-use electronic controls and a bright, digital display to simplify operation. Plus, the heater is engineered with several cut-off features. An energy cut-off stops operation in the case of abnormally high water temperatures, while the low water cut-off prevents damage to the elements when an inadequate water supply is available. These features help keep the heater working safely at maximum performance to deliver the convenience and reliability you expect in your business. Built to last, the stainless steel unit comes fully equipped with the gaskets and fittings necessary for installation. It also comes standard with 2" brass-plated plumbing fittings, which enable you to safely mount the heater beneath your sink. This particular model requires a 208V, 1 phase electrical connection for operation. Front to Back: 17 1/8"
Height (without heater connections): 9 3/4"